Less than 24 hours after relocating to take a new job in Southeast Asia, an American businessman and his family find themselves in the middle of a violent political revolt. That’s really all there is to No Escape, but it’s enough to fill 103 minutes with a surge of raw, primal-survival adrenaline as Jack Dwyer (Owen Wilson), his wife (Lake Bell) and their two young daughters (Sterling Jerins and Claire Geare) make a life-of-death dash along a terrifying gauntlet of madness, murder and mayhem. 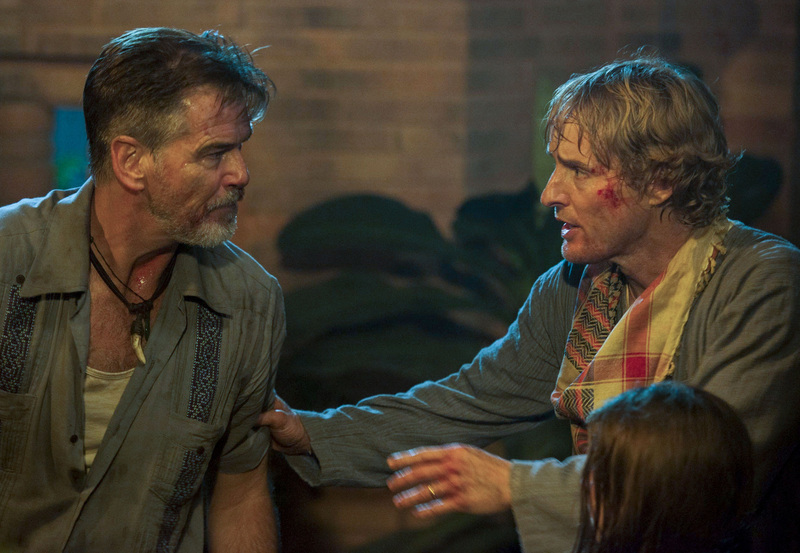 The movie was filmed in Thailand, but the country in which the (fictional) No Escape takes place is never named—likely because the filmmakers hope no specific part of the world (like Thailand) takes it personally. The rioting “natives” are a nameless, voiceless, mostly faceless horde of marauding Asians, but they might as well be zombies—or mutants, demons or even the Devil himself. Director John Erick Dowdle, working from a script co-written with his collaborator/brother Drew, keeps pulses pounding with some of the same pulpy shocks and lurid sights he used in the schlock-horror flicks Quarantine (2008), Devil (2010) and So Below (2014). Dowdle knows what makes an audience jump, jolt and squirm—like with a sequence in which Jack has to get his family, and himself, from one high rooftop onto another. But other parts of the movie are a mess: the editing is a jumble; action scenes downshift into slurry, blurry slow-mo for no good reason; in one scene, daylight abruptly turns into full nighttime; in another, it’s dry one second and pouring rain the next. Bodies pile up, buildings are bombed into rubble, Americans are slaughtered in the streets. 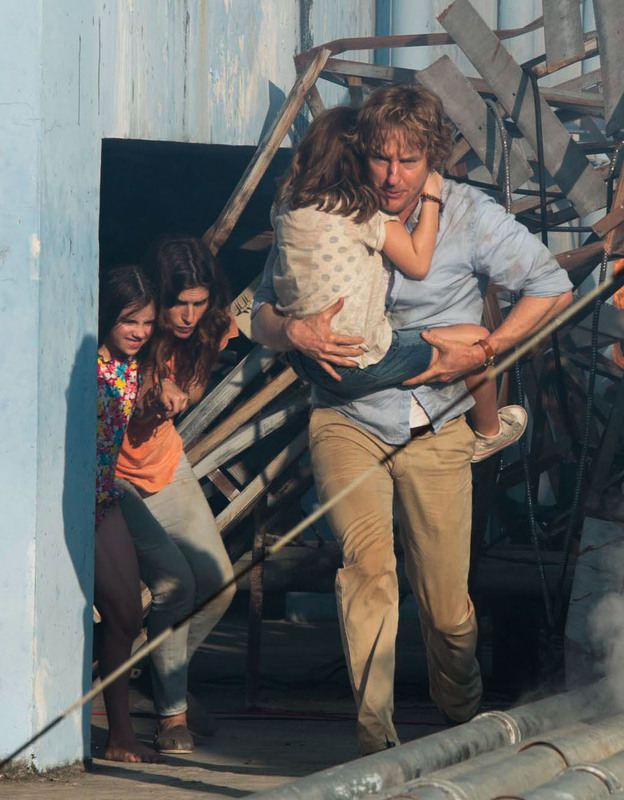 The title tells us there’s “no escape,” and for much of the movie, it sure looks that way. (The movie was originally titled The Coup, but test audiences apparently found that “foreign” phrase unappealing.) Thank goodness for Pierce Brosnan, who keeps showing up at just the right time as a British expatriate who knows his way around town, and then some. His character also provides a mini-lesson in the politics, multinational colonialism and economics that have caused the roiling ruckus—and the mob’s seething hatred of Americans. Wilson is best known for playing doofuses, and it’s interesting to see him in an out-of-his-element “everyman” role with more grit than goof-ery. Bell, currently starring in the Netflix comedy series Wet Hot American Summer, isn’t given much to do other than react to the horrific scenario. Dowdle amps up the tension, in scene after scene, of the terror of a white man, his wife and their two young daughters under the constant threat of being beaten, raped or killed by an all-male horde of “fourth-world” monsters. You may wince at its less-than-noble notions of race and cultural relations, but you can’t say that No Escape isn’t well timed. With a leading U.S. presidential contender campaigning to put up a wall to keep immigrant “rapists” and “killers” at bay, it seems safe to say a good number of people won’t have much trouble relating to Jack Dwyer’s desperation to shield his wife and kids from people on the “other side” of the world practically salivating to make them suffer and bleed. At one point, Brosnan’s character notes the situation’s blurred moral boundary lines—which give clarity to their situation. “There’s no good or bad here,” he says. “There’s just getting you and your family the hell out.” Once a lot of viewers get out of the muddled, nightmarish obstacle course that is No Escape, they might just see clearly enough to vow to never venture off the green, green grass of home ever again.